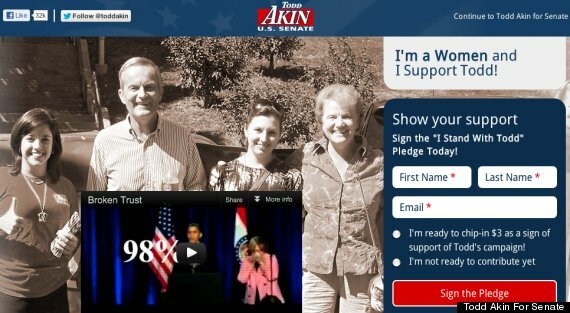 Continuing our Election 2012 theme, here's another gaffe which appeared on Republican Todd Akin's web site in his bid to become Senator of Missouri. Todd has form when it comes to issues related to women so he's clearly trying to redress the balance. That he can't tell one woman from several women doesn't do his cause much good, I fear. Even worse, though, is that one of the women featured in the photograph is not one of his supporters. The woman in question is on Akin's left. Yes, that one. The one whom Akin's wife, Lulli, is hugging so lovingly. She is, in fact, Corinne Matti and she's a full-time employee of the Missouri Democratic party. Her job as a Tracker is to attend and monitor Akin's public appearances and report back to her Democrat bosses. Surely he didn't simply grab the first women he could find? That would be entirely incorrect, wouldn't it? In fact, not politically correct.